A very different walk today. Took the 171 bus directly to the palace of Versailles and spent the morning walking thru the elaborate gardens that once belonged to the kings of France. 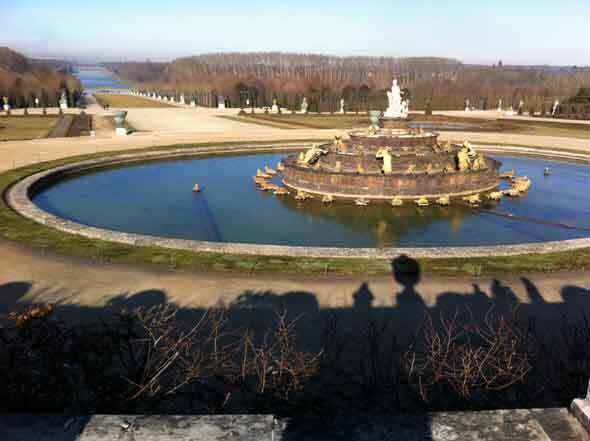 It is winter and the magnificent fountains are all shut-off for the season. The garden statues are wrapped to protect them from the weather, reminding me of the work of the contemporary artist Christo, who goes around “wrapping” the world’s monuments. But the walk itself is an enjoyable change. We pass the immense palace and follow the landscaping to a section of the gardens that is like a giant halloween cornmaze, only instead of people in scary costumes jumping out unexpectedly, here and there we would come onto a hidden fountain, or a wrapped statue (some of which did slightly remind me of halloween costumes — the mummy, the grim reaper and so on). The park was mostly empty apart from mainteance workers and the odd couple of tourists, and the incongrous sound of gunfire echoed from a shooting range somewhere nearby. We continued down thru the rows upon rows of trees planted with geometric precision. The king of France even wanted his gardens to “obey.” Yet we marvel at the beauty of the way he tamed nature to his will. The paths continue along founatins and wooded areas, with all sorts of interesting offshoots to explore, and the walk could be as short or as long as you like. Very different than our usual walks in the wild, but a great idea for something off-beat in winter when the park isn’t too crowded.